Got a fourth grader? 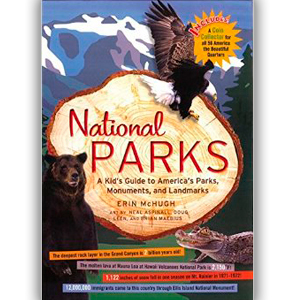 Here’s a great title to read in conjunction with the ‘Every Kid in a Park’ initiative, which gives families with fourth graders free access to national parks, national forests, national wildlife refuges, and national historic sites throughout the 2015-2016 school year. With twenty-one parks in Virginia alone, it’s a wonderful way for your children to learn about history, culture, and the great outdoors. With seventy-five overlooks, over one million visitors stop annually to take in the beautiful rolling hills along Skyline Drive. There are more than 500 miles of hiking trails and a variety of overnight options from lodges to cabins to camp grounds. History buffs will also enjoy a visit to Rapidan Camp, the recently restored summer retreat of President and Mrs. Herbert Hoover. In 1856, Washington was born a slave on a 207-acre farm in Franklin County. By exploring his birthplace, families can see how Washington’s past impacted his future as the most influential African American of his time. Restored to its 1930s appearance with original family pieces, Maggie Walker’s house commemorates the life of a progressive and talented African-American woman. She achieved success in the world of business as the first woman in the United States to charter and serve as president of a bank. The National Park site includes a visitor center detailing her life and the Jackson Ward community in which she lived and worked. The U.S. National Park Service has an annotated index of all twenty-one national parks in Virginia. So whether you want to stay local and visit the Richmond National Battlefield Park you keep seeing the sign for on Route 295 or you have the time to venture out to Assateague Island, the ‘Every Kid in a Park’ program can help get you there. Don’t have a fourth grader? Sign the ‘Every Kid in a Park’ pledge and get a free Parks for Play: 35 National Park Adventures for Kids of All Ages. It not only highlights Virginia parks, such as Fredericksburg and Spotsylvania Military Park, but it also provides information on sites that might fall into your short road trips category, such as Harpers Ferry National Historic Park in West Virginia and Great Smoky Mountains National Park in Tennessee. I’m thinking that a trip to Virgin Island National Park is in order, but while my husband appreciates the estimated $80 the ‘Every Kid in a Park’ initiative can save families with fourth graders, he insists it’s not enough of a cost savings to justify a trip to St. John. Luckily, there’s plenty to keep us busy close to home. For more info on Every Kid in a park click here.